« Breakfast session: Creative entrepreneurship, how to start? How do I set up a successful crowd funding campaign? What are the provincial subsidies for young professionals and your projects? How the Huis voor de Kunsten can help you in the application? This workshop will provide you the knowledge, skills and connections you need to be able to apply and create a great crowd funding campaign. It will give you an insight about the support you can receive from the Huis voor de Kunsten. 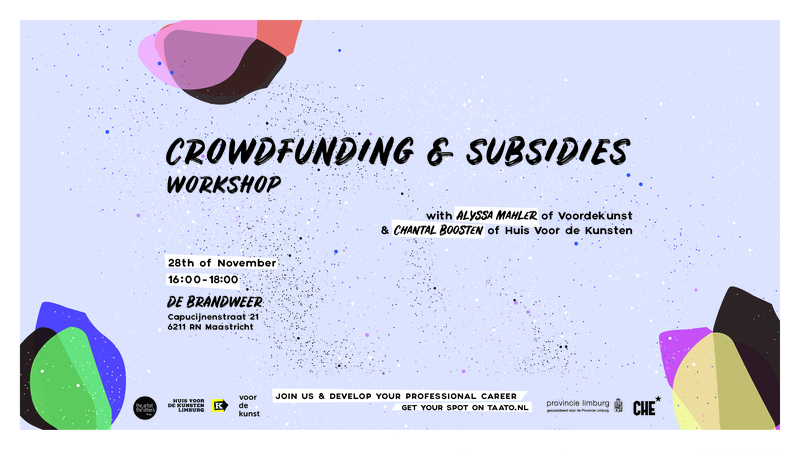 Alyssa Mahler from Voordekunst, the main crowd funding platform in The Netherlands, will share with us how to do a great crowd funding campaign, and all the insight you need to know to successfully develop your own. What is a good structure for a campaign? What could be my reward, how do a make a great video? You will also know more about the deal that the Province has with Voordekunst. Professionals who managed to created successful campaign will be there to talk about their experience and give you practical tips. Also, Chantal Boosten of Huis voor de Kunsten, explains what is the role of HVDK and what kind of advice you can ask to them. Join us and gain this must-have knowledge for developing your career.